Pictured from left are National Cancer Institute F31 fellows and Cancer Biology Graduate Program doctoral students Ethan Brock, Asra Shaik and Anthony Guastella. 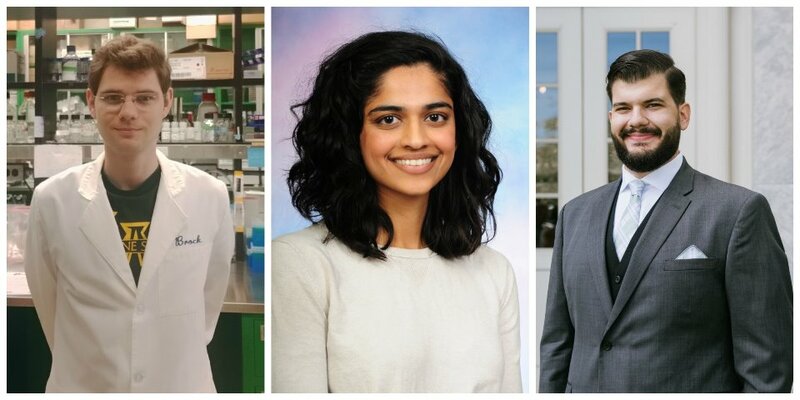 The National Institutes of Health has awarded three Wayne State University School of Medicine graduate students its coveted F31 Ruth L. Kirschstein National Research Service Award for Individual Predoctoral Fellows. Ethan Brock, Anthony Guastella and Asra Shaik are doctoral candidates enrolled in the WSU and Barbara Ann Karmanos Cancer Institute Cancer Biology Graduate Program. Shaik is also pursuing a joint M.D. degree with the School of Medicineâs M.D.-Ph.D. program. âI was really pleased to see all of our hard work pay off,â Brock said of receiving the award. He is mentored by Professor and Chair of Pharmacology Raymond Mattingly, Ph.D.
Brockâs project, âSprouty4 is a Negative Regulator of ERK/MAPK Signaling in Breast Cancer and Plays a Role in the Transition from In Situ to Invasive Disease,â investigates a marker that could aid in categorizing pre-invasive cancer as problematic or not. The current system doesnât predict which pre-invasive lesions will go on to become invasive cancer and which will not because current science lacks reliable markers to help doctors differentiate between problematic and non-problematic DCIS. âSo, to err on the side of safety it is standard for patients with DCIS to receive radiation after surgery. Unfortunately, studies have shown that this early intervention is not enough to substantially decrease the amount of advanced disease. This has led researchers and doctors to believe we are over-treating many patients, which translates to unneeded physical, psychological and financial burden,â Brock added. Brock received support from the Cancer Biology Graduate Programâs NIH T32 training grant from 2015 to 2017. He also received the Cancer Biology Directorâs Award, and, in his first year of the program, the Deanâs Enhancement for Undergraduate Academic Achievement Award. His poster presentation won third place at the KCI Molecular Therapeutics Annual Research Symposium earlier this year. âWhenever I tell someone I study tryptophan, they always seem to make a joke about turkey and getting sleepy after a big Thanksgiving meal, but tryptophan plays a much bigger role than that in our bodies,â Guastella said. His project, âPatient-derived glioblastoma in vitro and in vivo studies of tryptophan metabolism via the kynurenine pathway,â investigates the role of tryptophan metabolism in brain tumors. âWhen tryptophan enters our body, it is first used to build proteins. The tryptophan that is not used to build proteins can go down a few pathways, but most of the tryptophan ends up going down a pathway called the kynurenine pathway, which is what I focus on in my research,â he said. In healthy individuals, the kynurenine pathway produces NAD+, a molecule that is essential for metabolism. However, in cancer/brain tumor patients, the kynurenine pathway becomes dysfunctional and can suppress the immune systemâs ability to fight cancer cells. Guastella is mentored by Sandeep Mittal, M.D., chair of the Department of Neurosurgery and director of the Translational Neuro-Oncology Research Lab. âAnthony is a hard worker with a passion for science. He is my first graduate student, and we have both grown through this experience. It has been a pleasure working with him and watching him grow as a scientist,â Dr. Mittal said. Guastella received the Deanâs Diversity Fellowship in his first year of the program, the Initiative to Maximize Student Development Fellowship in year two and was awarded a spot on the T32 training grant in his third year. He also won first place for his poster presentation at the Cancer Biology Graduate Student Research Symposium and first place at an international conference for tryptophan research. He received a spot and travel award to attend an NIH-sponsored metabolomics workshop in Alabama in his third year of the program. âI am extremely grateful for this incredible opportunity and am very humbled that the NIH felt my ideas were worth funding. I spent countless hours reading literature and performing experiments trying to develop my hypothesis. This moment has been years in the making, so itâs exciting to finally harvest the fruits of my labor,â Guastella said. Shaik is in her fifth year of the Cancer Biology program and will return for her clinical M.D. years in 2018. She is mentored by Associate Professor of Oncology Michele Cote, Ph.D., M.P.H. âI am thrilled that the novel work Asra has proposed to examine the underlying mechanisms that put women who have benign breast disease at greater risk for later developing breast cancer has been selected for funding by the National Cancer Institute. In particular, the focus on African-American women who have worse outcomes after a diagnosis of breast cancer, and who are diagnosed at younger ages, highlights Asra's commitment to use her understanding of cancer biology to reduce cancer disparities,â Dr. Cote said. The goal of Shaikâs project â" âCharacterizing novel radiologic and pathologic tissue-based risk factors for breast cancer in African-American women with benign breast diseaseâ â" is to find features on mammograms and breast biopsy tissue that predict breast cancer in African-American women. âAfrican-American women suffer a disproportionately high breast cancer mortality rate and are more likely to be diagnosed with young-onset and aggressive cancer subtypes. Our findings may point to mechanisms that contribute to cancer development and may also help better identify women who are at high risk who are poised to benefit from additional screening or chemoprevention,â Shaik said.